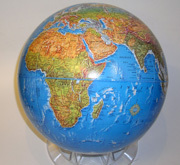 The Globe Stand is designed to fit 12″ (30 cm) relief globes or non-relief globes, and so is slightly larger than 12″ inner diameter to allow for the raised images. 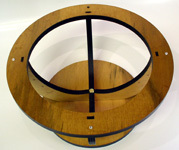 The stand allows for total visibility, rotation and measurement of the globes. Great Circles can be drawn and antipodes plotted. 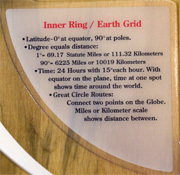 The stand is a unique tool to learn about, measure and mark on a variety of globes to learn about the Earth and important science theories. The wood stand is individually cut with a CO² laser for accuracy and precision. The wood used is ½” thick, 7 ply laminate, of Birch with Maple facing for strength, and non-warping durability. Each stand is hand stained and finished. Black and white ceramic N, E, S, W direction pegs are applied. The ring surface is positioned to be an accurate Equator/Great Circle position. 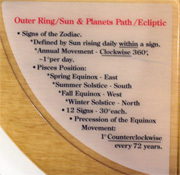 On the wood stand, the laser inscribes the current and range of the Earth’s Axis Tilt. Each leg is marked with latitude degrees to facilitate small circle plots. 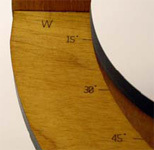 Two rotating plastic outer measurement rings are positioned on the wooden ring surface. 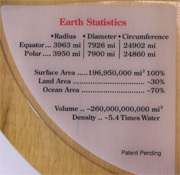 Useful Earth statistic information is attached to the base. The outer rotating ring contains the 12 signs of the Zodiac, in proper rotation sequence, to aid in star location throughout the seasons and ancient ages. Pisces is used as a reference guide. The constellation names symbol, month and direction of rotation are shown. 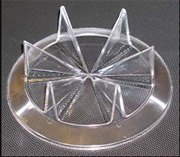 The inner ring rotates into a measurement position and contains easy to use 360° degree measures, along with time, miles and kilometer rules. Useful information is listed on the base for Earth Statistics, Outer Ring and Inner Ring References. Patent Pending on Globe Stand. To hold any 12″ globe when not in the Expanding Earth Globe Stand. Most used when you have more than one globe that you are working with. Relief Globes with the Five (5) Key Points clearly marked in color. Both globe balls are excellent for standard science studies and to explore alternative theories. 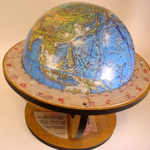 The Replogle relief globe is called the “World Ocean Series”. It is available from Replogle in a number of different named models, but all with a restrictive meridian attached. We use the highly accurate globe ball only and precisely mark the five (5) Key Points, which are directing expansion. The rest of the globe is unchanged. We like the World Ocean globe for its use of 1000-fathom (6000 feet) subsurface features. This allows the clear visibility of the Emperor and Hawaiian Chains, and some Key coastal Features such as the Nicaraguan Coast, the separation between Spain and France, and the west coast of India. 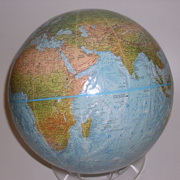 The G. F. Cram relief globe is called the “Enviro-Sphere”. It is available from Cram in a number of different named models, but all with restrictive meridians attached. We use the highly accurate globe ball only and precisely mark the five (5) Key Points, which are directing expansion. The rest of the globe is unchanged. We like the Enviro-Sphere for its use of the 100-fathom (600 feet) subsurface features. This allows the clear visibility of the Pacific Islands and atolls and several additional Hot Spot Chains. The shallow spreading zones like in Southeast Asia are more easily seen. Other 12″ globe balls for Venus, Mars, and the Moon, etc are available, but not from us. The Globe Stand can be used with them. Sky and Telescope, the astronomy magazine people, has the best selection we’ve found. 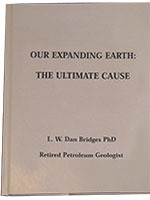 Important Books about Expanding Earth Theory which are hard to find and with limited distribution. It is expected this area will enlarge over time. Dr. Dan Bridges, a petroleum geologist, in this book focuses primarily on examining what the world believes are Meteor Impact sites such as the famous Chicxulub site in the Yucatan believed to be the cause of the dinosaur demise 65 MA years ago. Dan is convinced and shows that most of these sites are volcanic in origin from forces below, and that Chicxulub in particular was a super volcano. Read Full Review.